Welcome to Krügel. With over 60 partners in over 70 locations Krügel is member of the confern group, one of the largest removal groups operating in Europe. We organise and plan tailor-made removals, custom fit to the needs of our customers – from the initial planning right through to the quality control – for more than 35.000 moves each year. With over 1.000 special moving vans, approximately 2.100 employees and a modern communication network, we are on the highways of Europe every day in the service of our customers. Whether by sea or by air. To the port of destination, inland customs terminal or straight to your new home (door to door). We have the precise know-how and know the „ins-and-outs“ of customs and import regulations. Also included in our comprehensive moving service – from professional export packing to right through to transport insurance – is the option of having your furniture and/or belongings stored temporarily, for example if you haven’t found the right house or appartment, or if you plan on taking some but not all of your household goods, because your stay overseas is only temporary. Our service begins in your current home. It is here that we begin to discuss all the questions that need to be answered. With an overseas move we are at your side with our special packing service. Our first-class overseas packing is tailor-made to meet the requirements of this type of transport. Additionally, we handle all customs clearance formalities on your belhalf. You don’t need to bother yourself with complex and troublesome customs forms and regulations. Our cooperation partners in your country of destination take over where we leave off- whether its the transport from the port of entry to your new home, unloading the container, re-assembly of furniture or any other service or assistance you may require, they are there to help with whatever needs or wishes may arise. Welcome to Krügel Umzüge international removals. We realize that moving, whether it be locally, intrastate, or internationally, is a difficult and emotionally demanding process. As the consumer, you will be faced with difficult choices regarding service providers, packing materials, insurance coverage, as well as a number of other unfamiliar issues that will effect how smoothly your relocation will progress. Around the world: with Krügel Umzüge you’ve got a strong partner at your side. We are also member of EUROVAN, with EUROVAN your move is in good hands. With our partners – a league of leading removal companies throughout Europe – you have access to the best resources available, both before and after your move has been made. Overseas move, moving to Canada, Australia or even China? We have just the right transport option. With our network of leading removal companies throughout Europe, you have access to the best resources available, both before and after your move has been made. For us, it does not matter where you move, it is just a question of how you move. As soon as you know about your next move, you will realize that planning and organizing everything for your relocation is quite a task, and a lot of unresolved questions will probably arise, which you have not even had a chance to think about. 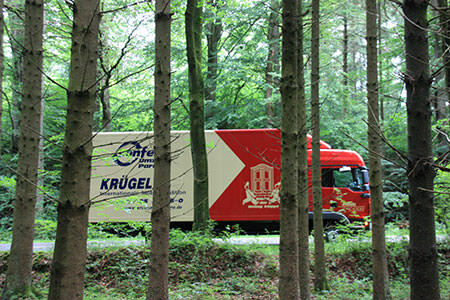 Your best choice for moving around the world: with Krügel Umzüge you’ve got a strong partner at your side – worldwide.